Diva Marketing Talks: Analytics tonight. Diva Marketing Talks - a live, internet radio show. 30-minutes. 2-guests. 1-topic related to social media marketing. Why? To help organizations understand social media marketing and how to join the conversation without getting blown-up. Can't join us live? The show morphs into a podcast! Tonight Diva Marketing Talks focuses on social space analytics. We're calling this one Blog Analytics A Step Towards Credibility?? Social media is fast taking its place at the grown-up marketing strategy table. With the respect, as a credible strategy, comes things like keeping elbows off the table and Accountability and the "M Word" - Measurement. Before you can measure "it" you have to define what "it" is. Our 2 guests are not only highly respected in the social media marketing world but bring the perspectives of agency and client side to the conversation. Peter Kim is an analyst at Forrester Research in Boston. His coverage area focuses on marketing strategy and organization, including advertising and accountability. Prior to joining Forrester, Peter was international marketing manager at PUMA AG; part of the strategy network at Razorfish; and a research analyst at Coopers & Lybrand focusing on the energy industry. Marianne Richmond has held senior level marketing positions with some of the largest consumer brands like Nabisco and Purina. From the agency side she's worked with Ally-Gargano/Marketing Corporation of America and DIMAC Direct. Her career direction has led to opening the doors of her own shop Resonance Partnership based in St. Louis. Tips From The Diva Bag: Blog Analytics A Step Towards Credibility?? Forget trying to find the Holy Grail definition or measurement and focus on what you want the end result to be...what you want your customer to do, believe, experience or think OR what role you want a specific media channel to play to achieve the end result. Once you know the desired outcome, then what it takes to get there... the metrics should fall out from there. Accurate targeting is critical success factor. Bad targeting=false metrics. All or nothing statements like "the page view is dead" will kill you....there never was and never will be one single one size fits all measurement except for sales and profits. Be free. There are many good packages available for no cost that provide excellent metrics. Think simple. Social media analytics work differently - focus on a few key indicators to start. Don't obsess. Metrics should help fine tune your communication strategy, not drive it. Can't call in but have a question for Marianne and Peter? Drop a comment and I'll ask it for you. What would you like Diva Talks to chat about? The show is available for download as podcast to your favorite MP3 player. Or play it right on your computer! BBF Tim Jackson, Masiguy, commented on a recent Diva post - "Blogger Relations Strategies are HUGE." I'd go so far as to say that many brands will take their first dive (or second step after first listening we hope) into social media not by writing a traditional blog but with a side step passive strategy of BR .. blogger relations. This quote from James Clifton, European Planning Director, Agency.com, reinforces my thoughts.- “We believe that it is important to look at the people driving social media and and work out how to engage them, rather than just jumping on the latest MySpace or YouTube bandwagon." Sidebar: Last month Agency.com released findings from, Who Is Driving Social Media, an analysis of what they term influencers - "uploaders. "The big strategic implication of the Uploaders study is clear – brands need to think of these digital influencers as a resource, not a target. - Dr. Paul Marsden. That's an interesting concept. Agency.com doesn't say brands should build relationships and expand community with bloggers but instead suggests that bloggers should be positioned as a "resource." And what is a "target?" I've sent off an eMail to Marianne Stefanowicz, Assoc. Director, PR & Marketing Agency.com Worldwide asking for clarification. Ms Stefanowicz was indicated as a contact on the release. Perhaps she'll drop a comment or respond back. If she does I'll let you know. Sidebar: *Active participation in social space: participation in the conversation: launching a blog or a YouTube video, joining a social networking site a la Facebook or Flickr, and what seems to be an extreme risk for brands -commenting on blogs. Let's take a look at some of the rationale why BR is gaining in acceptance. While a BRS may build a limited community, based on the program you develop, the downside is it's more likely you'll Not build community. Agency.com suggests that you invite "uploaders" to be brand advisors . Sounds like a vintage marketing strategy called a customer circle to me. Quess what's old is new again. All well and good you may say, but how does it affect brand equity? Great question Diva and Divo. Glad you asked. Immediate Future, an agency in Great Britain, took a look at how the social media buzz of major brands compared to the Interbrand Top 100. The results may surprise you .. or not. Immediate Future has generously shared results, methodology and offers their conclusions. Coke Flash! Although Coca Cola was ranked by Interbrand as The Number One Brand in 2006 my friends down the street don't show up in Immediate Future's Top Twenty-five Social Spaces Share of Voice. 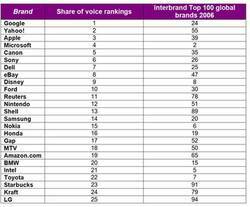 Google, with an Interbrand ranking of 24 is the #1 Brand when it comes to buzzz. Even with Coke's push into Second Life, YouTube and quasi consumer generated content it appears not many people wanted to be (part of) .. the Coke Side of Life. What does that mean? The data from this study was collected in April 2007 and Coke's virtual coke machine strategy launched mid month. Perhaps the buzz will build and 2007 will bring Coke into the top 25. Not sure what to make of this except another example that the game it is a changin! Sidebar: There are talented people who can help you navigate this new industry. It only takes a nano second to become an expert .. not! For some reason there are too many people who after seconds on Facebook or a few blog posts position themselves as experts. Please, please, please if you do choose to work with someone to develop social space strategies .. check credentials. With a dirty martini in hand and wearing your hot polka dot bikini TiVo Fellini's La Dolca and head over to Getting To The Point where Katya Andresen, is hosting this week's Nonprofit Consultant's Carnival. * The theme is Your Top Five .. Anything. What does a dirty martini, a hot polka dot bikini and a Fellini film have in common? At first glance not much but each in its own time and place was considered edgy and even innovative. And Katya is giving special treatment to posts that contain one of the following words: bikini, martini or Fellini. ... Watch For Six and Seven .. It's the world of conversations. That's not news .. you knew that girlfriend. The social space of blogs and Facebook and Twitters and Pownce and zillions of smash-up communities provide options .. oh so many options (! )for casual chats. But some afternoons it's nice to take a break, relax with a great cup of java or that special tea and let someone else do the work and lead the discussion .. in the old fashion genre of an interview. For your reading pleasure a few bloggers who are running "interview series." Rajesh Lawlani,BlogWorks offers Blog The Talk with a focus on industry leaders in social media and technology. Rajesh's most recent interview, with Guy Kawasaki, explores high tech investment and investors. Yvonne DiVita's, Lip-sticking, Smart Woman Online /Smart Man Online, provides wonderful insights into people and their passions. Geoff Livingston,The Biz Buzz, taps social media "in the know" people, with a slant towards the PR biz, in his Interview Series. Valeria Maltoni's, Conversation Agent, Ask (?) Away series is positioned as a recap of a conversation. Check out the right navigation bar under what else but ... "Conversations." In keeping with bloggy transparency, through a series of interviews, Shel Israel, Global Neighborhoods, is conducting and sharing research for his client SAP on his blog. Shel's Global Survey interviews are a great way to "get a handle on what is happening in the world regarding social media." Update: Merrill Durbrow, The Merrill Dubrow Blog, highlights leaders in marketing research industry in his interview series. Lessons Learned: An interview series is a terrific win-win-win content tactic. Your community wins. Your interviewee wins and You win too. In 2005, I met a cool divo by the name of Peter Flaschner, The Blog Studio, who presented me with an opportunity I couldn’t refuse. Peter offered to create a custom new blog “skin” for Diva Marketing. Through a series of posts, that included all the comps, we involved the community in the redesign. The invaluable feedback strongly influenced the design you're viewing. It was an awesome and fun experience and we all learned together what makes a great blog design. A few weeks ago (at the SITC New Media Nouveaux) I met a cool divo by the name of Ken Yarmosh, Viget Labs, who presented me with an opportunity I couldn’t refuse. Ken offered to take a look at the mysterious tech side of Diva Marketing and provide some suggestions on how to optimize Diva. Ken’s suggestions will range from functionality to some SEO stuff and perhaps some design ideas. We'll also review the flow and navigation. But Ken went one step further. Not only did he present this great opportunity to me but to the cool divo - Geoff Livingston, The Blog Buzz. As with the Diva design, I thought it would be another great experience to share with you and Ken agreed. So over the next few weeks Diva and The Blog Buzz will get a check up (Ken promised it wouldn’t hurt). Geoff and I will keep you posted on what the “Blog Docs” at Viget Labs find. In case you’re wondering why Geoff and I would trust our “babies” to Viget Labs, Viget Labs is a web consulting firm, of talented developers and marketers, based outside of Washington DC. They’ve done some amazing work including the development of Seth Godin’s Squidoo and Brittany Spears' website. Hmm .. from Seth to Brittany .. and The Buzz Blog and Diva Marketing .. what a range! This is sure to be an interesting adventure. Checking blog stats and noticed a referral from Ad Age. Seems they're in development with the Power 150. Here's a shot of the page. Shhh girfriend! Don't tell them but order is wrong. Diva Marketing is #7 and Seth is #64. Need Your Help. Who Gets The Book With The Pink Boa? The Diva of Cx3: Creativity, Community, Conversation - CK, CK's Blog, came up with an innovative idea to help education corporate American about the Age of Conversation .. not necessarily the book but the concept. Begin at the top with the CMO. CK is giving away 5 Age of Conversation books to 5 Chief Marketing Officers at 5 F500. Sidebar: perhaps it should be the Diva of CX4? Creativity, Community, Conversation, CK. Mario Vellandi, Melodies in Marketing, is playing too. Gotta check out his Convo Cone graphic .. a new twist on one of my fav desserts .. ice cream cones. Wonder where the jimmies go? In India, Arun Rajagopa Clicks n’ Bytes from Muscat, Sultanate of Oman is on board to drop a few presents to the CMOs in his country. I love this idea so much that I want to play along too. My challenge .. who gets the book? CK is wrapping hers in shiny paper with a big red bow. I'm thinking shiny paper with a pink boa might entice the package to be delivered to the right person. I need your help. Who do you think should get the Age of Conversation book with the pink boa wrap? The only rules are no duplicate companies and it must be a Fortune 500. Updated: Here's link to the Fortune 500 List. Wind down your day with Diva Marketing's new live, internet radio show .. Diva Marketing Talks. 30-minutes. 2-guests. 1-topic related to social media marketing. Why? To help organizations understand social media marketing and how to join the conversation without getting blown-up. Can't join us live? The show morphs into a podcast! Tonight Diva Marketing Talks focuses on how business-to-business can leverage social media. As C.B. says, "Paul talks real estate. I talk flooring. Our mission is to showcase how blogs and social media can be used effectively inside verticals." With C.B. and Paul at the mic we have the talent to build the foundation of a great B2B social media strategy .. from the floor up. Paul Chaney is one of the visionaries of social media. He began the first association for bloggers, opened the doors to the first company offering services by blog copywriters, wrote one of the first successful business blogs. And then was made an offer he couldn't refuse .. to help develop a social media company targeting the real estate industry. Paul puts his talents to work as Blogging Systems' Vice-President for Business Development and as Partner in newly-formed Nacht & Chaney Social Media Consulting. Along the way he managed to write a book - Reality Blogging Book too. Paul blogs at active rain. 1. Blog about what you know relative to the industry. There will come a point in time when you will reach the limit of your own knowledge. When that happens, reference tip #2. 2. Read other industry-relevant blogs. The easiest way to do this is to subscribe to RSS feeds. 3. Keyword-optimized posts written on a regular basis (minimum 3-5 times per week) will give you your best chance of increasing your presence in SERPs as well as establishing your credibility within the industry. It's a slow build. Be steady, consistent and don't lose your focus. Connect the new with the old to help demonstrate the value of the medium and the information available there. Be contagious when you blog and when you explain what social media is/how to use it. It's about sharing your passion! Next week, July 31 - Diva Marketing Talks Analytics with Marianne Richmond, Resonance Partnership and Peter Kim, Forrester Research. Update: Diva Talks podcast is up on Blogtalkradio. CB and Paul were awesome. A warm welcome to our first caller, Ines Hegedus-Garcia from Miamism. Congrats! to Todd Andrlik. Todd developed the Power 150 - a rating system resulting in a list of the top 150 marketing/ad blogs in the world. Now he's taking the Power 150 to the "Power Ad Rag." He's partnering with Advertising Age to include the list in the pub. Where and how the Power 150 will be placed and positioned is still in development. But what makes this especially significant is the acknowledgment of a traditional institution (yes, Girlfriend Ad Age is indeed an "institution" albeit for the ad industry) that blogs and bloggers matter. 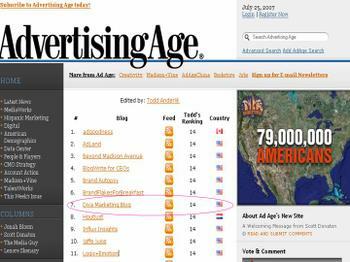 That blogs and bloggers are credible resources for Advertising Age's readers. Todd - thanks for including Diva Marketing. I am honored that Diva has been part of the Power 150 since day one. Friday Fun: Are You A Bag Lady? I've a riddle for you. No cheating don't scroll down! What is filled with danger and intrigue? Is something common but personal and very intimate. It holds emotion, pleasure, beauty, finance, disgust and sometimes despair. No, it's not the new Harry Potter book. No, it's not the next James Bond film. No, it's not the next Lindsey Lohan or Paris Hilton media blitz. Give up? It's a woman's purse sometimes called a handbag or pocketbook or clutch. Kelley Styring, InsightFarm, found that the mysterious world of a woman's purse is even more than that. It might just be a clue to unlocking billions of dollars in new product opportunities for marketers. Kelly spent over 100 hours interviewing 100 woman and exploring the contents of their pocketbook. She found remarkable insights into their lives and a surprise .. potential unmet needs. Did you know that 95% of U.S. women aged 18-64 take a purse with them Every Day? I bet the divas of marketing to women, Yvonne, Mary and Michele, could tell you that women make about 70% of all retail buys. Think of if this way .. that seeming innocent Coach bag or Target special is the only physical link between home - where needs are created and the store - where those needs can be fulfilled. (K. Styring). What is in that pocketbook and how it is found may be the catalyst for the next iPhone. I'm thinking a lipstick and mirror holder, as part of an iPhone, would be ultra cool. Kelley Styring boasts that “In Your Purse: Archaeology of the American Handbag” is the first quantitative and qualitative study to delve into the contents and context of a woman’s purse. Kelly has even turned her findings into a clever YouTube video. Well worth a watch. Divas what is in your purse? I'll start - In my pink purse I found: a wallet, cell phone, blue tooth thingy, lip gloss, gourmet tea bags (for when I travel and don't want to drink the boring stuff or horrid coffee), note book, pens, biz card holder and a piece of chocolate. Sidebar Update: Sorry, didn't mean to leave out the divos. For divos, like BBF Lewis Green .. what's in your man purse? I'm thinking a man purse research project is something I could get into (smile).